For more information and to register, visit the main event website. The internet has had disruptive effects on many aspects of the ecosystem in which authors reach readers. The roles of publishers, retailers, libraries, and universities, and other participants in this ecosystem are evolving rapidly. Amazon.com, in particular, has been the source of considerable controversy in its dealings with authors and publishers. In order for authors to navigate these turbulent waters, they need to be strategic in their partnerships and careful in contracting. Copyright is supposed to help even authors with no legal expertise, but how good a job does it do? Could some changes in that law help authors reach readers more effectively? Looking beyond the law, what steps can authors take now to realize the full impact of their writings? 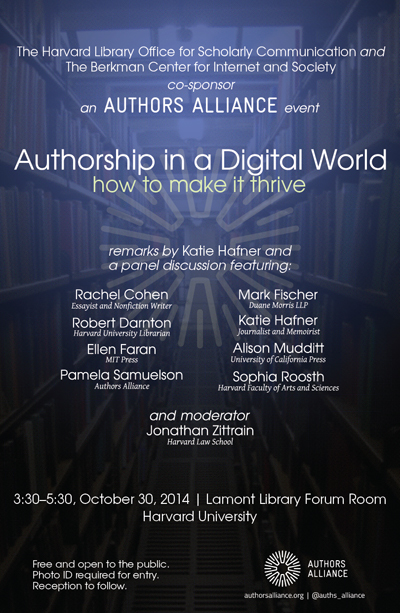 With these questions in mind, the Harvard Library Office for Scholarly Communication and the Berkman Center for Internet and Society are co-sponsoring the Authors Alliance in bringing a panel discussion on the challenges and opportunities facing authors in the digital age to the Harvard campus. The discussion will be preceded by remarks from Katie Hafner, a journalist, the author of six books, and a member of the Authors Alliance and advisory board. Pamela Samuelson, Authors Alliance co-founder and law professor at U.C. Berkeley. A reception will follow will the panel. The event will be webcast and recorded. Details on the webcast will be posted on the event page and at http://authorsalliance.org prior to the event.